Volkano Widow series Black folding Drone Copyright © 2019 ComXpert International CC - COPYING IS ONLY ALLOWED FOR THE PURPOSE OF SENDING US ENQUIRIES. E&OE. Learn to fly with the Widow Series drone. The lightweight, foldable design features two speed settings, one-key return and the 6-axis control give you the ability to perform 360° flips. Let the A.L.L (Automatic Lift & Landing) make takeoff and landing a breeze and stay airborne with Altitude Hold technology. The best price and guaranteed service and backup from official computer suppliers in South Africa for the VK6001BLACK Volkano Widow series Black folding Drone. 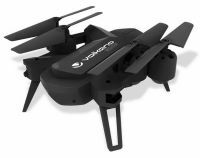 The Volkano VK6001BLACK Volkano Widow series Black folding Drone is available for R574. The product is sold by ComX Computers as new. Prices are valid today 2019-04-23 (before 2019-04-24 , by quote, while stocks last). The product is expected to be in stock, although this is not guaranteed. Find related VK6001BLACK Volkano Widow series Black folding Drone products in our Drones Category for even more options. Read reviews and find out about VK6001BLACK Volkano Widow series Black folding Drone. Discounts, specials and cheap prices only at ComX Computers.